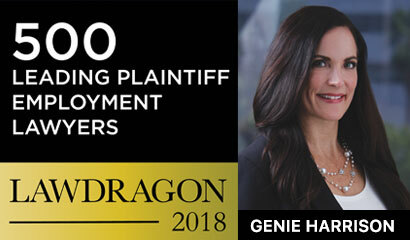 California employment attorney Genie Harrison has been named to Lawdragon 500 Leading Plaintiff Employment Lawyers guide. The 2018 Lawdragon 500 Leading Plaintiff Employment Lawyers were chosen based on a research-driven, journalistic process that, for the past two years, vetted the views of peers and competitors, and recognizes those who are “winning big for workers” just 10 or so years into practice, alongside esteemed lawyers who have been fighting the battle for more than 50 years. To view the complete list of Lawdragon 500 Leading Plaintiff Employment Lawyers CLICK HERE.